Are you there? Share your story and images on CNN iReport. Read more about this story from CNN affiliate KOVR. (CNN) -- Southwest Airlines announced Saturday that it is grounding 81 planes for inspection following an incident in which one of its flights was forced to make an emergency landing after a 3-foot hole tore open in the fuselage of the plane. Investigators are trying to determine the cause of the "depressurization event" and have "decided to keep a subset of its Boeing 737 fleet out of the flying schedule to begin an aggressive inspection effort in cooperation with Boeing engineers," according to a company statement. "The safety of our Customers and Employees is our primary concern, and we are grateful there were no serious injuries," said Mike Van de Ven, Southwest's executive vice president and chief operating officer. The plane managed to land safely at a military base in Yuma, Arizona on Friday, where authorities "discovered a hole in the top of the aircraft," the company said earlier. Meanwhile, passengers who were aboard the crippled the Boeing 737 said they had feared for their lives. "We were in shock," passenger Debbie Downey told CNN Saturday. "We were in row 16 and my husband and I could see blue sky ... the wiring, the cabling. It actually was terrifying." 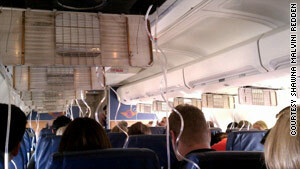 Oxygen masks dropped from the ceiling about a minute after the hole blew open, passenger Greg Hansen told CNN. She said. "a lot of people were crying and holding hands" but had trouble hearing due to the noise of air rushing through the plane's opening. "It was very, very scary." "I heard a loud popping sound about three or four minutes before it blew open on us," passenger Greg Hansen said. "(Then) a big explosion happened. A big noise, and from there, you felt some of the air being sucked out. It happened right behind me, in the row behind me and it covers about two-and-a-half rows," he said from seat 11C. Hansen, 41, a regional sales manager for a biotech company, was flying home to Sacramento, California, from a business trip. Some people panicked and screamed as the blue sky and sun began to shine through the cabin in mid-flight, he said. "Most people were just white knuckles holding onto the arm rests. The pilots did a great job and were under control to get us to a manageable level," he said. But just behind him, Hansen said he could see the jagged edge of the aircraft where the rivets used to be. "You can see the insulation and wiring. The interior ceiling panel was bouncing up and down with the air," he said. "It was surreal, when you're riding in a modern aircraft. You're used to being enclosed and not having the window rolled down," he said. Hansen described the hole as being about 3 or 4 feet long and about a foot wide. Passenger Brenda Reese told CNN affiliates KCRA and KOVR she began to fear for her life. "I was texting my sister to make certain that she told my kids that I loved them," Reese said. The Federal Aviation Administration (FAA) said the captain made a rapid, controlled descent from 36,000 feet to about 11,000 feet after the cabin lost pressure. "We do not know the cause of the decompression," said Ian Gregor of the FAA. Hansen said the incident took place about 35 minutes into the flight. He says that it took about 45 seconds or a minute before the oxygen masks came down after the hole blew open. "The crew was pretty calm about it. They walked around and checked on everyone," he said. "But it wasn't like the movies where papers get sucked out of the hole, but you could feel it and hear the noise." Hansen said that most of the passengers were complaining of a pain in their eardrums from a rapid descent. Southwest Airlines said only one injury was reported. "There are no reported customer injuries," according to a statement released by the airline. "One of the flight attendants, however, received a minor injury upon descent." Hansen said one male flight attendant appeared to fall and was bleeding from a facial injury. Yuma International Airport spokeswoman Gen Grosse said passengers were tended to and given refreshments because the temperature on the tarmac was close to 100 degrees. Hansen said passengers deplaned and boarded another Southwest Airlines plane for Sacramento. He said the airline offered passengers accommodations in Yuma, but did not know if any passengers chose to stay. The second flight landed in Sacramento on Friday night. In a written statement, Boeing spokeswoman Julie O'Donnell declined to comment on possible causes of the incident. "Boeing is dedicated to the safety of its airplanes and the people who fly on them," O'Donnell said. "We are providing technical assistance to the U.S. National Transportation Safety Board as it investigates the incident. In accordance with international convention, we cannot speculate on either the cause or whether this incident is similar to or different from anything in the past; any questions about the investigation must be directed to the NTSB." The NTSB said an investigative team was scheduled to arriveSaturday in Yuma. CNN's John Branch, Rich Phillips, Deborah Doft and Greg Morrison contributed to this report.